While American consumers clamor for the latest and greatest in consumer electronics, our older digital devices are inundating and poisoning a generation of children in Ghana. Colorado Springs Gazette photographer Michael Ciaglo recently visited the largest e-waste processing site in the African nation and returned with some very damning images. That new iPhone of yours had better be worth it. The site is called Agbogbloshie, an illegal settlement/landfill outside of Ghana's capitol city of Accra. Roughly four acres in size and home to more than 40,000 migrants and refugees, Agbogbloshie has become one of the world's foremost "digital dumping grounds." It's a major destination for the developed world's electronic waste, processing millions of tons of unwanted electronics every year. 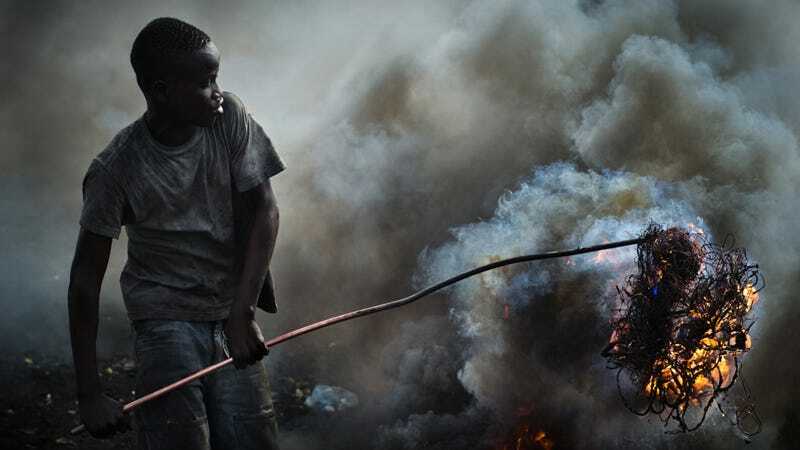 Most of this "processing" work is performed by young men and children who burn electronics to extract the valuable copper that they contain for pennies on the dollar. A "good haul" reportedly earns workers less than $4 a day, while releasing hordes of toxic chemicals into the environment. This deadly chemical cocktail poisons the surrounding land, air, water, and workers—stunting their mental and physical development. Of course, there are international conventions in place to prevent this sort of thing from happening, the Basel Convention specifically. But like Haiti and Afghanistan, the US has refused to ratify it and many firms from signatory countries, including the UK and Japan, have found workarounds. See, in the early 1990s, Western countries began exporting second-hand electronics to Africa as a means of bridging the digital divide—and it worked. Ghanaians could finally afford personal electronics—which cost a tenth of what new equipment would—but the "donations" quickly putrefied into illegal dumping and export schemes under the guise of aide. It's far more profitable for unscrupulous e-waste recycling companies to simply ship off their junk to distant African shores than to actually process the electronics themselves. And it's not like first world consumers have any control over what happens to their electronics after they trade them in—nor have they shown an particular interest in knowing.